Smart TV is no longer a new concept but there are continuous improvements that are making TV better connected than ever. At the forefront of this innovation is Samsung Electronics’ 2018 Smart TV lineup. 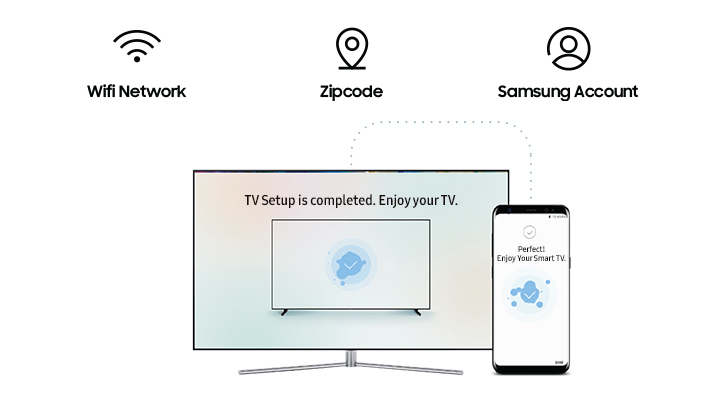 In 2018, Samsung TVs now connect seamlessly with mobile devices. And unlike in the years past, this interconnectedness is now simple to achieve, making content sharing and personalized recommendations a breeze. 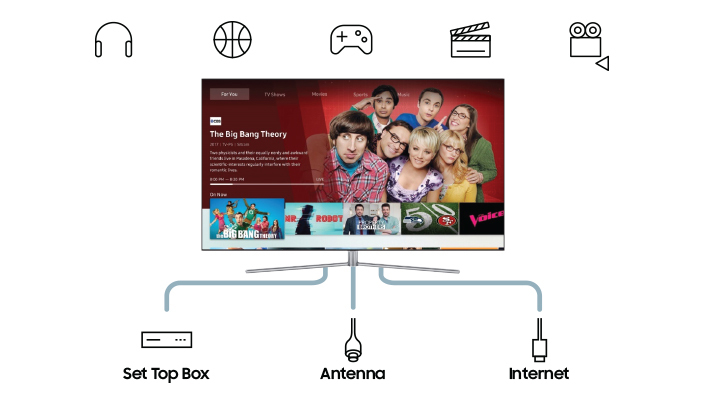 There’s no longer a tradeoff to having a top end smart TV with a range of exciting features. There’s no need to get lost in a maze of menus if you want to set up your TV – in fact the opposite is true with the 2018 Samsung Smart TVs. Thanks to the SmartThings app, you’ll have access to everything you need to get set up and enjoying your new television quickly. With a few tap of the mobile app, SmartThings enables your TV to recognize your Wi-Fi connection, your set-top boxes, favorite apps and Samsung account information. Taking this fast lane to smart TV installation means you get to watch your favorite shows quickly. And even here, SmartThings shows its intelligence. If you’re already logged in to a video application on your mobile device, your TV connects to the same account without having to re-enter your login details on screen. You can quickly choose which of your apps connect in this way to your TV. But your mobile phone isn’t just used to set up your TV. It will become part of a daily way to interact with it. For example, you can use it to set a reminder for when the game is on. And this is a smart reminder that knows what channel the game is on and enables you to switch to it right away without having to remember what channel it comes on. The connectivity gets better still. In 2018, all Samsung Smart TVs will feature the SmartThings dashboard. This will enable your TV to not just be the center of your living room, but the Internet of Things (IoT) hub for your entire home. You’ll be able to see what’s in your fridge, control the lights, adjust the thermostat and do many other things – all from the TV screen. You’ll even be able to use your TV to instantly share photos captured during special moments like your unforgettable trip to Paris with your parents back home. We’ve listened to our users who told us they wanted to connect more conveniently with their home. This will enable them to do so. Although the TV is getting smarter, the device should always be primarily about enjoying content. There are enhancements in this area too when it comes to finding what to watch. This year sees Samsung make improvements to its Universal Guide, which can recommend movies, TV shows, sports and more all from one place. It integrates content from your cable provider as well as VOD and streaming services onto one consolidated page. And the recommendations are made based on your preferences. To make browsing even easier, you could use the intuitive Samsung One Remote, which controls not just your TV, but other devices connected to it, such as a cable box, Blu-ray player, and the internet. It’s recently been enhanced with the ability to control AV products connected with an optical cable. Additional options available through 2018 Samsung Smart TVs include enhanced TV PLUS. This enables users to find and enjoy UHD and HDR movies from a large selection – 8,900 movies, including 195 in UHD – available through the Samsung Smart TV user interface. The selection is constantly growing thanks to Samsung’s ever-expanding list of content partnerships, which will make it easier and easier for users to find and enjoy the UHD and HDR movies that they want to see. Meanwhile, Steam Link allows users to stream their favorite Steam PC games in 4K from their computer to play on their TV. More than 6,000 games are already available and can be streamed without purchasing a separate Steam Link device. We’ve given you a choice of methods to find your way to great content. One of the newest and most innovative ways is through the use of your voice. Bixby, Samsung’s intelligent assistant platform, will be included in Samsung’s 2018 premium TV line up, launching first in Korea and the US. Not only will it enable you to use your voice to interact with content from various providers such as Amazon, but it will also allow you to unlock a range of other possibilities that add a new layer of convenience. For example, you could ask Bixby to switch your TV to a particular channel or play a particular song. You could even ask Bixby to do the hard work such as finding Oscar-winning movies. Away from entertainment, Bixby can tell you the news or weather, control your IoT devices throughout the house, or show you your most recent photos. It’s another example of how the TV is now more than the device you use to view terrestrial content. 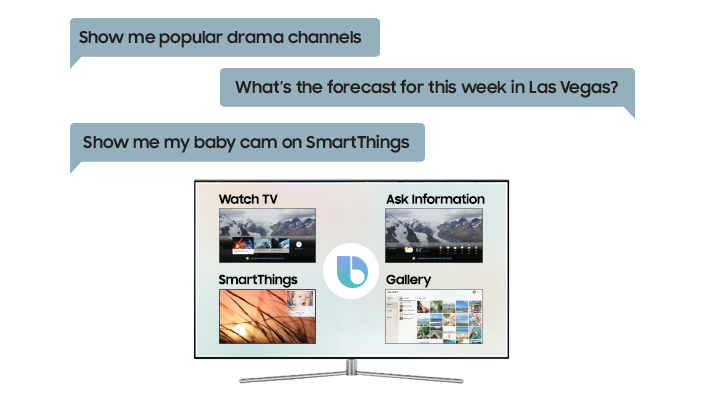 Thanks to SmartThings and Bixby, the TV is now part of Samsung’s ecosystem of connected devices that can all communicate with each other. In the case of Samsung’s 2018 Smart TVs, they are now able to carry out a great deal of functions and activities. But the core function is ease of use. The connected home is one where users can enjoy life with fewer distractions and complications. Samsung’s Smart TVs will be major drivers of this experience.